Towers of up to 500 chiral cubic structures can rotate around their axis under load. Achiral structures do not exhibit this behavior. Photo: T. Frenzel/KIT. Using 3D printers, researchers at Karlsruhe Institute of Technology (KIT) in Germany have succeeded in creating a metamaterial from cubic building blocks that rotates in response to compression forces. Usually, this transfer of force can only be achieved with a crankshaft. 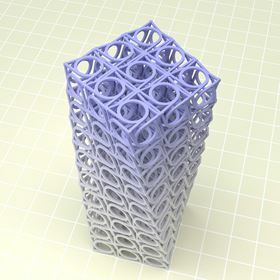 The sophisticated design of this metamaterial, which is made up of bars and ring structures, and the underlying mathematics are described in a paper in Science. “If a force is exerted from above onto a material, the latter deforms in various ways: it may be bulged, compressed or bent,” says Martin Wegener, professor of the Institute of Applied Physics and director of the Institute of Nanotechnology at KIT. “According to the valid rules of mechanics, however, it will not rotate.” Together with his colleagues Tobias Frenzel and Muamer Kadic, Wegener has now succeeded in designing a filigree cubic structure that reacts to loading by rotating around its axis. The team produced towers of these cubic structures of variable sizes and strengths using a 3D microprinting method established at KIT. The edge length of the cubes ranged from 100µm to 500µm, and the researchers built towers made up of between four and 500 cubes. To check their theory, they also built towers of achiral cubes, i.e. cubes that can be mapped to their mirror image. The scientists found that towers assembled from chiral blocks could rotate around their axis under the impact of a force. “We measured a rotation by up to two degrees per percent of deformation,” Frenzel says. In contrast, the towers made of achiral cubic structures did not exhibit this rotation. The researchers also found that the stiffness of the towers increased with the number of cubes, although the dimensions of the individual components decreased proportionally. According to Frenzel, there is still a long way to go before they can think about potential applications. However, this work was inspired by their previous studies of elastic ‘invisibility cloaks’, which might be used to buffer shock waves from earthquakes or divert them around historic buildings.